Distributing donations in freezing cold Calais. Another trip to Calais, this time in freezing conditions – snow greeted us on our arrival at the warehouse. It is difficult to write about anything that people don’t already know. It was cold, the refugees have little or no shelter, donations are always needed, volunteers try and help. I have therefore decided to describe the process of distribution. This takes some preparation back in the warehouse, firstly assembling the items for distribution, then loading into the van and working through with new volunteers the procedures to follow to ensure a safe, secure distribution. On the second day we were there the items to distribute were coats from the general donations and pre-prepared rucksacks that children from a school in Wales had put together, containing hats, gloves, scarf, some easy to consume food (dates, biscuits), a warm jumper, a few other bits and pieces, and a little note from the donor. A member of staff from the school had brought these packs over and was helping to distribute them. We also took coats of various sizes. Before leaving for the distribution location we have a practice drill where key roles are allocated. One person to be in the van to select and pass items to two people who actually hand out the donations. Next, we have two people, normally larger male volunteers who can be seen as security, holding onto the rear doors to make sure people don’t try and bypass the system and help themselves. One volunteer acts as a gatekeeper who lets through people one at a time to keep the distribution orderly, and finally all remaining volunteers link hands with the ‘door’ persons to try and control the queue. Experience has shown that there are always people trying to game the system, so a new method for distribution has been developed. On arrival at the distribution point, refugees are asked to form a line. Once this is in some semblance of order one experienced volunteer hands out numbered tickets. This task is done fairly quickly so that people do not leave the line and try and get a second ticket by pretending they have just arrived. Bear in mind this is in an open air location with perhaps 150 people milling about. The volunteers then form into their preplanned formation and the distribution then begins. The gatekeeper tries to keep people in their numerical sequence but this is not a strict requirement. The key is to make sure everyone has a valid ticket before they get passed through to the two giving items out. Once there they are asked if they want a rucksack or coat. If a coat is requested then the volunteer makes a guess at the size and calls back to the van person for that size. The refugee gets a choice of one of three coats offered. It is felt that giving a choice of items at least allows some control to the person in need – it is dehumanising to rely on straight handouts therefore most distributions are made with a choice of items. One thing I have found on most trips is there always seems to be one refugee who takes on the task of helping the distribution. On this occasion a man from Iraqi Kurdistan stood by me (I was on door duty) and spoke with the refugees as they chose items, sometimes to explain that there were no more items of a certain size, or to tell the person that the coat was good. He spoke very good English and was able to translate when people had questions. He neither expected nor got any special treatment – he was just helping out in the difficult situation. 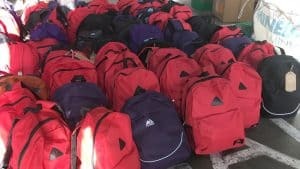 We gave out around 150 packs, either coats or rucksacks. It was good to see when we arrived that a van giving hot food was just clearing up so that we knew that the refugees had been fed. People do care about the conditions these people are in, but the authorities are just not listening. Each time we go to Calais it is disappointing to see piles of donations that are not appropriate for the needs of the refugees in Calais. The warehouse is now separating some items in preparation for sending a shipping container to Syria, but it also has a significant amount of items which are too big to be useful. Arabic men are generally smaller than western Europeans so much of the Large and Extra Large clothing is surplus to requirements. Prior to going this time I contacted local homeless and similar organisations in Colchester and found a contact who can use such items. We returned with the car as packed as when we went out (including roofbox) and having put the jumpers, fleeces, shirts and trousers through a quick wash to freshen them up, they are now heading to Harwich where an organisation will be offering them to local people in need. 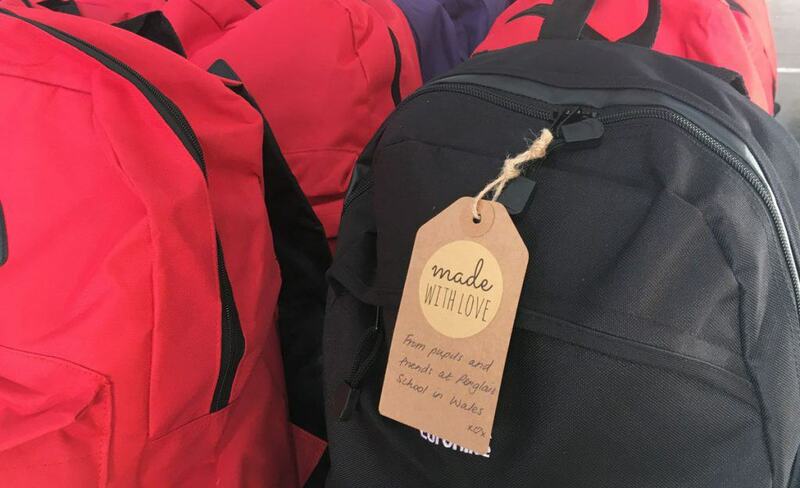 Another trip to Calais is being planned for the new year, and we are also looking to shortly launch a fundraising initiative for boots – the single most requested item whilst we were on distribution. This entry was posted in Calais, News. Bookmark the permalink.